What's your go-to beach look? Have a great week and thanks for stoppping by! Hi Lilli, I'm enjoying your beach photos on instagram. Love to wear espadrilles on the beach, a hat is important too, kaftans and shades. Enjoy the summer! I agree Lilli! Effortlessly chic yet fresh and easy should be the way to go when it comes to beach fashion. Best to keep it simple and not forget the sun protection :) Have a great week babe! this is a very style Look formten beach. I like the idea with a kimono over the swimsuit and of course the important accessory at the beach is high protecting sun cream. Beh io per ricordarmi la protezione devo guardare mio figlio, siccome lui si scotta e gli devo mettere la crema a quel punto si accende la lampadina anche a me! Bella la selezione con i toni del cipria, trez chic! Mi piace l'idea del kimono sul costume, bellissimo look! I very rarely go to the beach but I'd wear the kimono and the sunnies! I found this site and I love it. Easy to read and nice fashion tips. Oh yes! 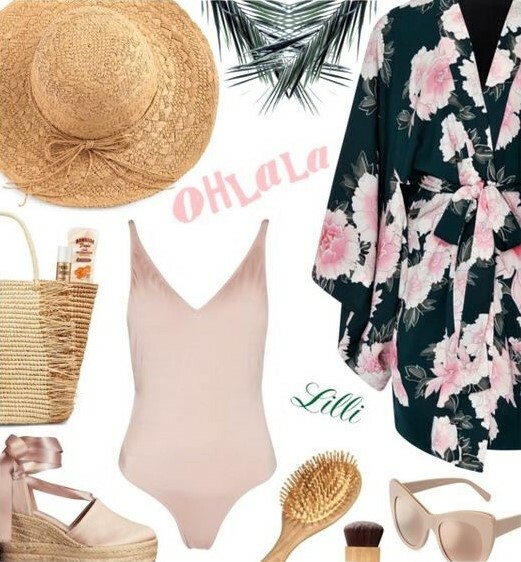 All these items create a super chic look for the beach. Love it! Definitely these items can not miss in the beach bag, a kimono like that seems ideal to be comfortable and fresh. Kisses. Lilli.